This weekend Ben and Pappa had lots of chores to do, and we got them done. 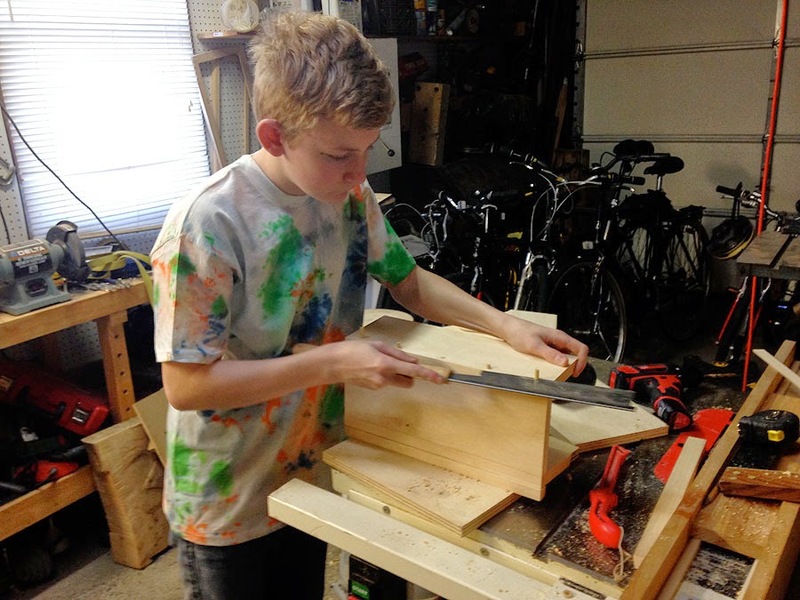 In between the chores Ben wanted to make a garden tool box for his Mom for Easter. We got a set of plans online and went to work. Ben did 99% of the work with Pappa's guidance. 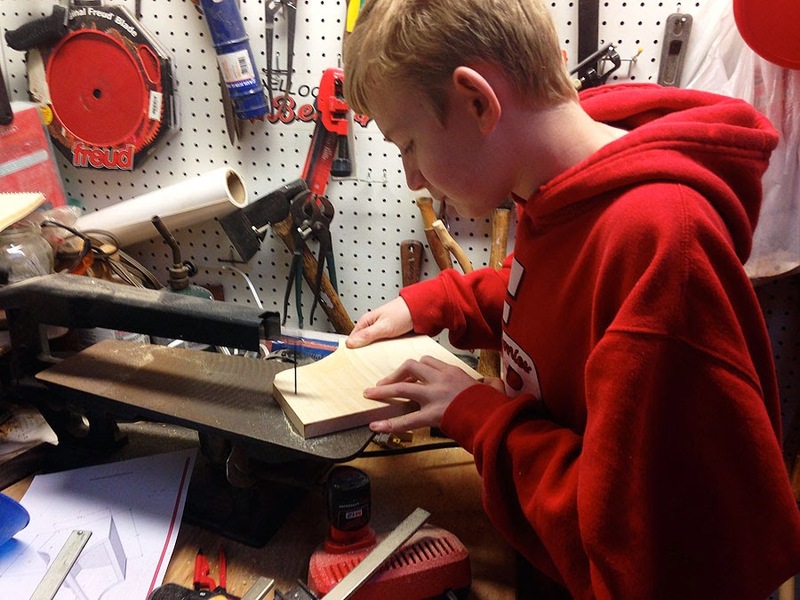 In the process Ben used the scroll saw, table saw, drill press, thickness planer, sander and many hand tools including a very fine toothed Japanese hand saw (one of Pappa's favorite tools) and clamps, lots and lots of clamps. 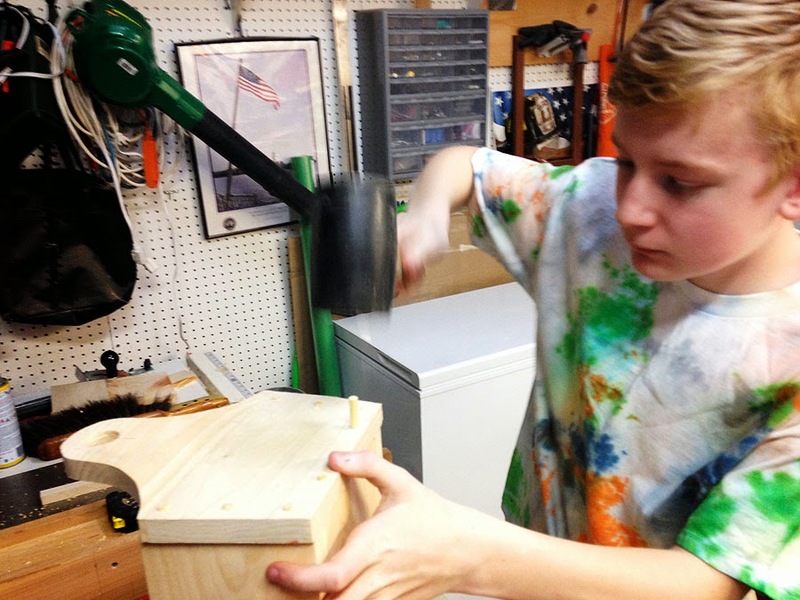 The cool thing about his project is that it had no screws or nails in it at all, it is held together with glue and dowels. We made a jig to make sure we had proper alignment of the dowels. and everything was cut at either a 7º or 14º angle so we had to be very careful about making things square. We started this about 9:15 in the morning - glueing up some boards to make a piece of wood large enough for the ends. We clamped it up and did some chores while it was drying. And we went back and forth all day from woodworking to chores, we did some concrete patching, and painted the front porch took down storm windows and other things, even made a quick trip to the Home Depot (no Saturday is complete with out at least one trip to the Home Depot, or at least to the Benny's) --- and of course Pappa did not get a photo of the finished product - sloppy work Pappa. We finished up by 5:30 just in time to color Easter Eggs -- Mom was very pleased with her Garden Box. . .